Reading Ambassador Keith Demicoli leading an activity during the prize-giving ceremony. 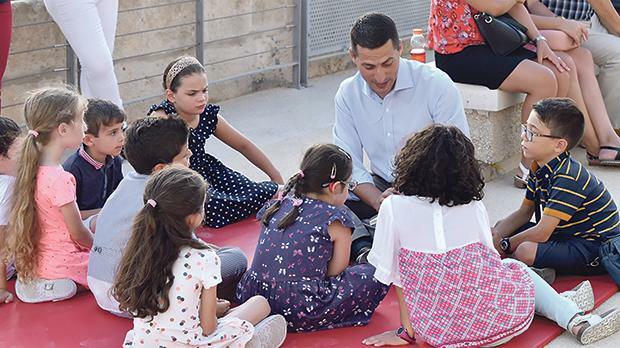 A prize-giving ceremony for the winners of the ‘Kemm Qrajt fis-Sajf’ summer reading challenge and the bookmark design competitions was recently held by the National Literacy Agency at Fort St Angelo, Vittoriosa. A total of 928 participants took part in the competitions. Eighty participants in the summer reading challenge competition and 10 participants in the bookmark design competition won books kindly provided by Agenda Book Shop, Book Distributors Ltd, Merlin Library, Merlin Publishers, Klabb Kotba Maltin, Enrichment Ltd and Faraxa Publishers. Besides being presented with their prizes and a certificate, the winners also took part in reading and writing activities led by the National Literacy Agency’s reading animators and writing tutors. Vanessa Ciantar from Heritage Malta and Reading Ambassador Keith Demicoli also took part in the ceremony, which was hosted by Heritage Malta and supported by W.O.T ART.